The following church history comes from newspaper articles and historical society records. Thank you to Don Lau and MaryAnn Debbink for their research and for being “keepers of the history” for our church. In 1843, the first Methodist Church Society was organized and the Rev. David Lewis was appointed minister of the circuit, which included the land between Lake Michigan and Fond du Lac. Church services were conducted in members’ homes. Rev. Lewis said that there was no human habitation for 20 or 30 miles between Saukville and Sheboygan Falls. Rev. Lewis was given a warm welcome at the home of James Gibbs, whose wife was a Methodist. The Gibbs family lived in the area that is now Gibbsville. When Rev. Lewis arrived, a parsonage had been built, but it was “imperiled by mortgage.” Rev. Lewis offered his horse, saddle and $1.50 for liquidation of the debt. The offer was accepted and he traveled on foot for the next two years before he was able to purchase another horse. 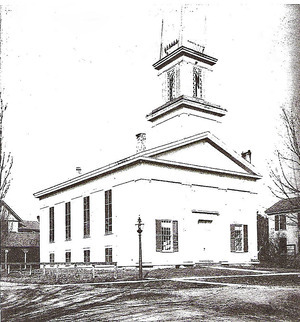 Four years later in 1847, the Methodist Church Society, which had 13 members, purchased our current church property from David Giddings for the sum of $30. In 1849, Rev. Matthias Himebaugh was appointed as the new pastor and the church became a separate charge. After raising $1,200, the members began building the church. They hand-picked trees, mostly white pine and cherry, and blazed, cut and sawed them. Progress was slow, and it was said that Mrs. Himebaugh and other church women held candles and lamps so the men could work at night in order to get the church built faster. After 2 months of building, more funds were needed. Rev. Himebaugh traveled to Milwaukee, Chicago, and several other cities to raise funds. The final cost of building came to $1,750. The church measured 40’x60’ and had a full basement. The foundation was field stone and mortar. 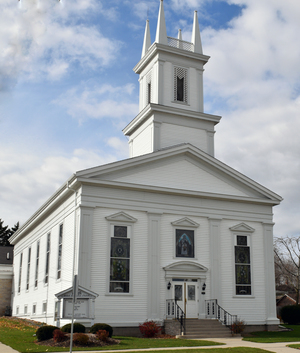 Our church was considered the finest Greek revival architecture of a public building in the city. Our bell tower, capped by four spires, is quite unique in Wisconsin church architecture. Our church was dedicated on November 15, 1851. By 1859, the Methodist Episcopal Church had 150 members, two local pastors and a large Sunday School, and was one of the strongest charges in the conference. The parsonage was rebuilt in 1893. In 1901, Pastor T.W. Sprowls arrived to find the church in bad shape. Renovations were started which included new floors, a furnace room and larger kitchen in the basement, a steel-pressed ceiling, pulpit platform and carpeting in the sanctuary, electric lights, and a new Epworth organ. There were two large heaters in the sanctuary, an oak heater in the basement, and a cook stove in the kitchen. New opalescent memorial windows were installed on both sides of the sanctuary and on each side and above the front door. The old horse sheds were removed to make room for an addition across the end of the church for a new pipe organ, a choir loft, and pastor’s room and a choir assembly area. Cost of the renovations was $1,600. Around 1930, the old chandeliers were removed from the sanctuary and new, lantern-type light fixtures were installed. In 1940, the word "Episcopal" was dropped and we became The Methodist Church. 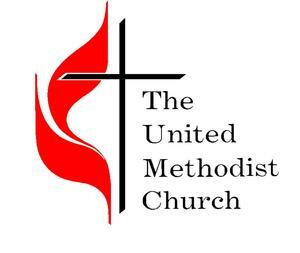 Then in 1968, we united with the Evangelical United Bretheran Church and became The United Methodist Church. One year later, in 1969, we became Faith United Methodist Church. In 1951 we celebrated the 100th anniversary of our church building with another building program. Repairs were made to the south wall and it was faced with concrete blocks, a fireproof furnace room was added, and a new rear entrance was built. There was a large garage behind the church, and about 60 members of the congregation got together and, using no machinery, picked up the garage and carried it to it’s new location about 100 feet north. New chancel furniture and other sanctuary furnishings were donated, and our current pipe organ was purchased and dedicated on April 24, 1966. Our current parsonage was built in 1959, and the educational wing, Fellowship Hall, kitchen, library, offices, bathrooms, and basement under all was added in 1967. Faith UMC opened the first nursery school in Sheboygan Falls in 1972. We celebrated our 125th anniversary on October 3, 1976, the same day the church was landmarked by Sheboygan County Landmarks, Ltd.
A new 4,000 square foot, $200,000 addition was begun in 1991, allowing handicapped access, and adding the parlor and air conditioning. Fellowship Hall was re-roofed, insulation added, and the parking lot was re-graded and paved. The new addition was dedicated on December 6, 1992. Throughout the decades, we have had many pastors, 54 of them in the first 100 years. On July 2, 2013, Pastor Susan Safford-Gaul arrived at Faith UMC to begin her ministry. As you can see, pastors and parishioners come and go, but our church building has a rich history and has been a strong legacy from one generation to another. It has required care and dedication by church members for 167 years. Since its original completion in 1851, our church has undergone six major renovations. Each has required commitment and sacrifice by many generations of Faith UMC members. Like many before us, we have the obligation to be “keepers of the flame” for many more generations of Faith UMC families.